I know what you’re doing this week. The week between Christmas and New Year’s Eve is when you start digging online looking at gyms, low-cost personal trainers and yoga classes—because this year you’re going to get in shape. Seriously, no excuses this time. Mind you, there’s always a risk for black folks trying out New Year’s fitness goals in gentrified spaces. If your city isn’t kind enough to provide you with several trap-yoga classes, you might end up becoming a think piece for Becky. The same can be said for running clubs. Despite an explosion of black running clubs across America over the last few years, from Des Moines to Detroit to Dallas, the image of black people running for fun, community and exercise is still rare. 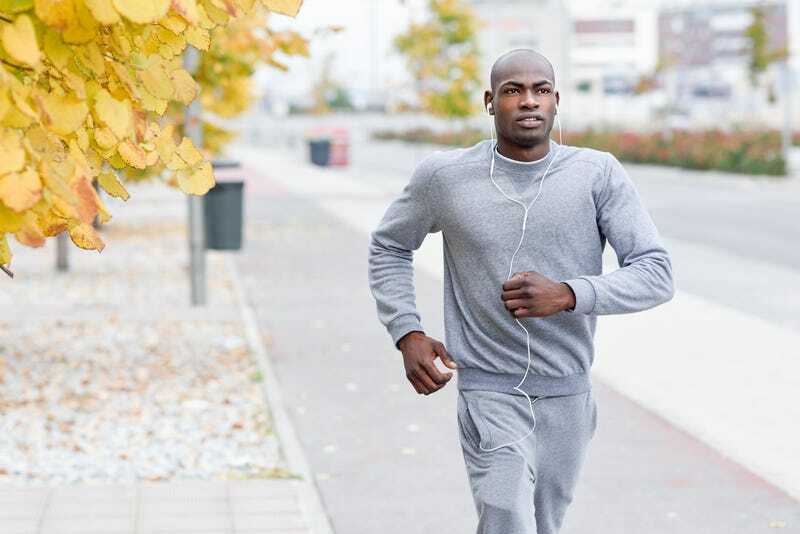 Type “run club” or “marathon” into Google Images and you’ll see happy couples running and bland motivational quotes like, “No matter how slow you go, you’re still lapping everyone on the couch!” But what you won’t see is black people. Now a group of run enthusiasts, organizers and athletes are going to change all that with “the Race” half-marathon in Atlanta in October 2018. Running clubs and running groups are often depicted as mostly white affairs. They’re like step 5 of the inevitable gentrification process. One of the main reasons is that while there may be many black running groups in America, there have been very few citywide, black-owned and -operated races to promote those groups. It’s one thing to represent; it’s something else to be writing those checks. Thus the birth of the Unity Collective, a collaboration of black running groups and individuals, to fill that void. According to Da’Rel Patterson of The Real Runners of Atlanta podcast, this moment is long overdue. The Unity Collective launched a kickstarter a month ago hoping for $60,000 in seed money to support the Race effort. They’ll have reached their goal by Dec. 31 with over 750 backers, and by Jan. 15 they’ll be opening registrations for the Race, which takes place Oct. 13. However, the Race is about more than just ticking off a few Kwanzaa principles before the end of the year (Umoja and Ujima, if you’re paying attention). It’s also about instilling pride and rebranding parts of Atlanta and hopefully other cities in America. “Atlanta is a great place to start, but we need support from all of the major cities and running-community influencers in order to create the legacy event we envision,” says Tes Sobomehin Marshall, director of the Race and founder of runningnerds LLC. All too often when half-marathons are planned, they follow the same racial and economic redlining tactics that scar most American cities. Half-marathon routes look like gerrymandered varicose veins, running straight through central city parks but avoiding black neighborhoods, circling a new plaza full of vegan-wrap joints, but taking a hard left before the black-owned bookstores and art studios. The Race half-marathon [13.1-mile] course will go through historically black communities and neighborhoods that often get overlooked for these types of events. There are historic parts of Atlanta that have never seen a group of runners trekking their streets. The hope is that a successful race in October will set the template for how other black running groups can get national attention and put on successful races in the future. As of right now, the Race has supporters from all over the country, and the Race itself is expected to attract runners of all colors and nationalities once the main marketing push gets started. So if your personal and squad goals in 2018 are to finally run that half-marathon and strike a blow against “run-gentrification,” the Race may be the perfect weekend for you. Just remember, you can’t win if you don’t get off the couch. P.S. : After years of watching running groups go by while I ate doughnuts at Starbucks, I was inspired by this story to actually support the Race. And yes, it looks as if I might be doing my first half-marathon next year! Welcome to Kwanzaa Week at The Root!